"Millennium Falcon: Smugglers Run" & "Star Wars: Rise of the Resistance" announced as new ride names for Disney's Star Wars Land. 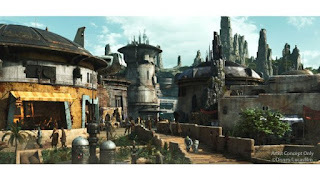 "Disney Parks, Experiences and Consumer Products Chairman Bob Chapek just revealed the names of the two signature attractions set for Star Wars: Galaxy’s Edge when it opens at the Disneyland Resort next summer and at the Walt Disney World Resort in fall 2019." Read the entire article here on Disney's blog for all the details.